Residents spoke out at Thursday night's Columbia School Board meeting about the hiring of a director of operations through a joint venture between the Columbia and ELANCO districts. Selected comments are shown below. 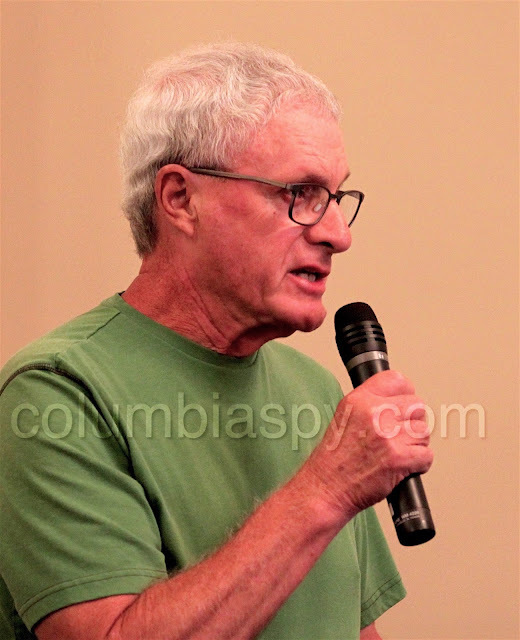 1) Don Groom, resident, took the podium first during public comments: "Regarding [agenda items] D 8, 9, 10 "I'd like someone to explain to me the purpose of these job title changes." Business Manager Amy Light:"During public comment, it's really not appropriate for a board to respond. The reason for the job title changes is to better reflect a more accurate picture of what those duties entail. There were some changes in food service department, and so they requested to change job titles and modify job descriptions a little bit to better reflect what is actually occurring in the food service department." Groom: "Have their responsibilities changed?" Light: "There were no major changes to job responsibilities. There were minor changes to job duties. Groom: "Were there pay increases?" Light: "No, there were no salary changes." 2) Frank Doutrich, resident: "I'd like you to elaborate on [agenda item] D3, executive service contract, so I understand it." Attorney Michael Grab: "The purpose of that is to simply conform the existing statement that was approved by the board at the previous meeting to the actual start dates that the superintendent began, so the original start dates of the SOW [Statement of Work] didn't reflect what the actual dates were, which is August 9." 3) Former board member Vernon Detz: " I want to get some clarification on the executive order, to clarify the timeline here, in my own mind. "On 6-14-16 at the committee of the whole meeting, the ELANCO contract was approved. So it brings me to June 16...If we are entering into this contract with ELANCO, why did we approve to the continuation of Dr. Klawitter as an acting superintendent, from July 1 at an annual salary of $115,000? Klawitter's position will end on the first day that a permanent superintendent officially takes office or December 21, 2016, whichever is first. To receive a full complement of sick, personal, and vacation days given to administrators. Were we paying $115,000 for a six-month contract?" Light: "That was an annual salary - $115,000 and pro-rated by the number of days he actually worked." Detz: "Was his last day August 8, 9 or is he actually still employed?" ELANCO Superintendent Dr. Robert Hollister: "Everything took a little longer than we thought, so we had to keep Dr. Klawitter on past his original agreement of July 1. Technically, I am the superintendent of record as of last week. So, he is now officially gone." Detz: "Did the board have a statement of the SOW when they entered into this agreement? Grab: "The process was actually a Master of Service Agreement executed with ELANCO... the first document in connection with the shared technology services project, and so there was a separate statement of work that was prepared for the tech services. The next proposal was for 'shared executive services,' and there was a statement of work prepared for that and then that was provided to the board. The board had that full review in advance of it's action on it and in fact I had reviewed as well and prepared a memorandum for the board outlining any issues or concerns I had with it and after review of that, the board acted on it at the June meeting." Detz: "In the paper last week . . . Dr. Hollister does in fact have a job description, but board members haven't been given the final job description or the organizational chart. To me that sounds like they didn't have the job description prior to entering into this, so how you can vote on something you don't know what's contained in it?" Grab: "Just to clarify, the statement of work actually contained for both Doctor Hollister and for the director of operations contained the Schedule A and the Schedule B that listed what those duties would be, so they actually were flushed out. Now whether it included every potential, possible duty that each one might engage in, I don't think that that was anybody's understanding. The idea was to outline as fully and as clearly as both districts could what the vision was, but there certainly was an outline of what those duties would be for both the superintendent and for the director of operations and that was in that SOW." Detz: "The $165,000... I'm a little concerned that it is more than that. What ELANCO can bill Columbia for says all reasonable travel, communications including cell phones, administrative and other out-of-pocket expenses incurred by ELANCO. Is that in addition to the $165,000 or is that incorporated in that $165,000?" Grab: "That's scheduled to be in addition to." Detz: "I see some board members that have a confused look." Board member Kathy Hohenadel: "That is not what I thought that we agreed to. I thought we agreed to a maximum of $165,000 that was not to exceed $165,000 and to be billed in monthly installments." Detz: "I'd like to have clarification on that." Grab: "The invoices are subject to approval by CBSD board." Detz: "Will internet charges be billed back to Columbia?" Hollister: "None of that, none of that, will be a part, that's all part of the contracted service. And I'm being very careful about not using my folks paid from Lancaster County as part of this. I'm trying to determine as accurate as possible what the cost is and what the savings is to both school districts. I'm trying to be very careful with every expenditure. The milage is going to be very minimal." Detz: If, after the one year agreement, we hire Mr. Strickler on, we need to pay ELANCO a Finders fee of 25 % of his final contract or $30,000. Is $30,000 the top, the max that we would pay?" Grab: Clarified that "It is the greater of, 25% or $30,000." The only time Columbia would have to pay that is if it wants to keep the DOO on as an employee, but ELANCO also had work for the DOO and basically offered the DOO a position. Under those circumstances then Columbia Borough School District would have to reimburse ELANCO for those costs." Detz: "There is talk of a $200,000 grant being available for this, who will write and apply for that grant? Whoever writes it are they get the majority of funds for that grant or are we going to see a recoup of the $165,000?" Hollister: "We haven't seen the grant, so I really don't know what the requirements will be or how that money will be allocated. In my mind's eye, it would be shared, but I can't promise you that until I see what the requirements are." Detz: "Is there a timeline?" Hollister: "It's on my to-do list. I'm going to find out,because we could sure use it. This is a lot of work to navigate, because there was no road map. I'm optimistic that we'll see that before Christmas, but it's the general assembly we're talking about." Detz: "If CBSD has to hire someone to do additional work that cannot be done by DOO or superintendent...how high could that cost go?" Grab: "The idea was to create a safety valve provision in the agreement that says if something else needs to be provided that neither the superintendent nor the DOO can provide, there's a mechanism in the agreement that provides for that, but of course all that would have to be approved by both boards, including any additional expenditure." Detz: "We won't have a true cost of this position. "Dr. Hollister if you could speak to this, one of you're things is to evaluate the administration of Columbia Borough. I'm wondering where you'll get that input since you are only contracted to be here four days a month." Hollister: "I would get that input from from multiple sources, including the DOO, as well as other folks and interact with the principals. But ultimately, the meeting times I have with them, I will articulate very clear goals and we will measure against those goals." Detz: "Will the DOO be evaluating teachers?" Detz: "When you say he would be giving input, I was wondering like, what would kind of input he would be giving?" 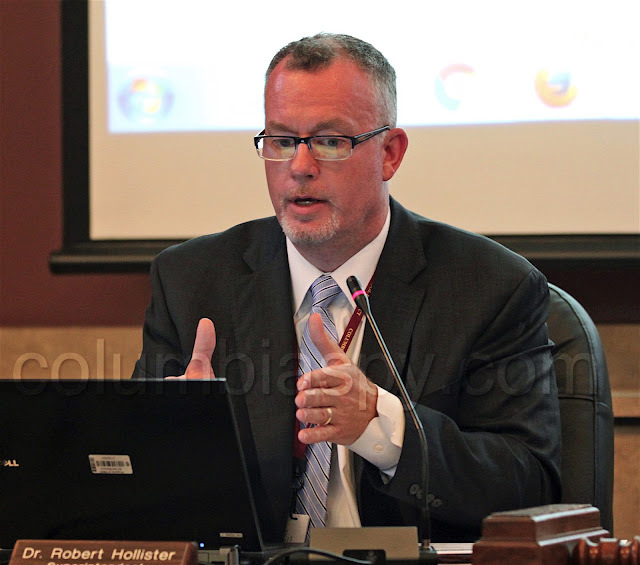 Hollister: "For example, I'm shooting from the hip, 'How quickly do principals respond to parent requests? I mean, that's something he can give me. How adept are principals at solving problems related to the scope of that? Communication.' Now we've got to be very careful in fact, getting back to the job description, one of the things that's delaying the publication, I actually went to vet our job description with PDE to make sure that certification doesn't have a problem with what were doing. There's a lot of folks who have to check on that job description again because this position doesn't exist anywhere in the commonwealth, so were trying to make sure we cover all the bases." 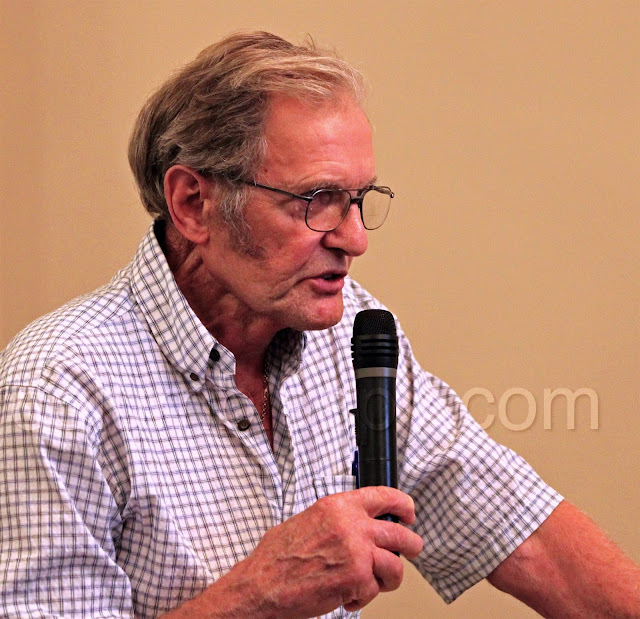 4) Former board member Fran Resch: "As important as this meeting was this evening, I think that it seems like everybody is very ill-prepared for the questions that were going to be asked this evening. I hope you didn't jump the gun thinking that you were just going to come to a meeting and not have questions asked of you. I don't want things to be hurried along a month from now we're asking the same questions, a month after that the same questions." Vickie Kronenwetter, resident and retired teacher with administrative certification: "Dr. Hollister, in your agreement you said that your goal was to have same level of service in CBSD as we would have with a seated superintendent. You, ELANCO, has hired someone without certification. A few minutes ago you just said we should have checked with PDE what impact "lacking certification" is going to have on his position as DOO. When you have a school district where everyone has levels of certification and you bring in someone without certification and you have them communicate with your administrative team and carry that back to you or you have them communicate with teachers who are members of a union. You needed to check. the person you hired, I dont see them being capable of doing the job that you are going to put upon them. There had to be an applicant out there who had certification. And the fact that few minutes ago you were answering questions and you said we have to check with PDE what impact the lack of certification is going to have on this position, is really bad coming at this point. Hollister: "That's not what I said. I said, that I need to vet our job description to ensure that we are not violating anything that PDE would have us do. The job description doesn't include observations of educational personnel evaluations, so I think we're splitting hairs. Kronenwetter: Didn't [unintelligible] just say "It includes communication between those certified instructional people and administration and yourself?" Kronenwetter: Thats a little scary. Kronenwetter: "A little scary. I'm a thirty-year educator with an administrative certification, and that just - it threw red flags up." Sharon Lintner, resident: "The other evening at ELANCO, Dr. Hollister, you told us that you had furloughed 15 teachers and outsourced. 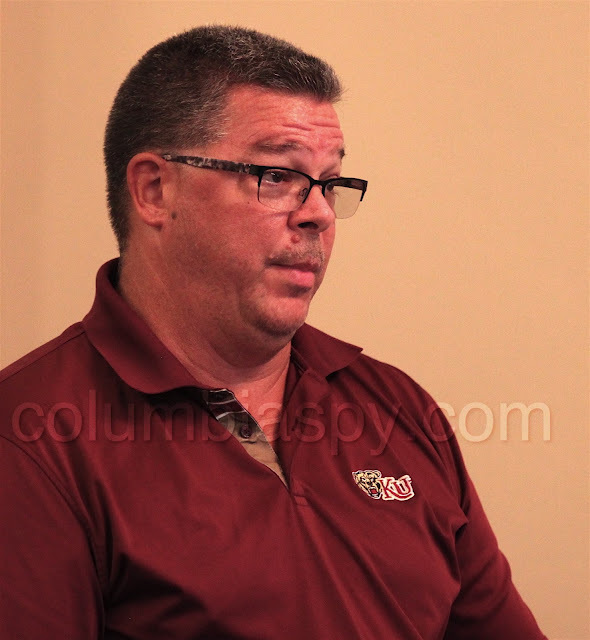 Do you anticipate that could happen in Columbia?" Hollister: "I have no idea. That was five years ago. Things are a little different here now. That was some time ago. We've since hired most of those teachers back, and we've saved a lot. Most of them are back with us." Just read here that Hollister stated that he would get information from the doo to use when evaluating our administrators. You have got to be joking!!! Wait until our administrators , with extended degrees in education, learn that a non certified doo is going to have a say in their evaluations. Hollister also said that the DOO cannot evaluate teachers. What ???? Just read that if the school board decides to keep the new doo, Mr. S., after one year, that the taxpayers will be forced to pay Elanco up to 30,000 in our tax dollars for a finders fee for them finding Mr. S. for us. My God , will this insanity soon end. This is criminal. What school board member would ever vote for a scam like this??? Hollister said that he needs to vet the doo with Pennsylvania Department of Education to make sure that there are no violations. He needs to? and the doo is already on payroll. Just how dumb does he think Columbia taxpayers are? How about Section 324 A of the PA. school code. This section makes it very clear that this doo is a circumvention of the spirit of the law. Once upon a time a man wanted a job and he said , I can create a doo job that I can do. In a nut shell, nobody knows what is going from the administrative end. Mr. Nikolaus,put your explanations in plain English. Overall, the taxpayers of Columbia are getting rakef over the coals. Hey, Hollister, you create a position and not quite sure if it is OK with PDE.This is scary. This whole thing is just unbelievable and it wreaks of impropriety!!! Even though the idea of a shared Super may have some merit, the contract, Elanco, and the new doo seem to be unacceptable choices. Learning as we go is a dismissal of Columbia taxpayers. If the people in question really had Columbia students at heart, they would end this agreement because it is clearly bogus. Our school district , thanks to the doo is now the Libre of Lancaster county schools. Over the weekend, in 4 different social settings, the doo was a topic of heated discussions, all negative. When do we get some old fashioned Columbia straight talk? It appears to be factual, from a previous school board member, that the current doo applied for the open superintendent job here in Columbia about 4 years ago. Talk about impropriety. Shameless. Someone needs to bring this out in the open if it can be proven. To the people elected and appointed to the school board---We trusted you to do what is right for our students and our district. It is my hope that you reexamine your actions based on the trust that taxpayers placed in you. There is still time to do the right thing. Please end this embarrassing charade and help our students grow into trusting young people. If the ELANCO district needs the money since the leftover $30,000goes into their general fund, have them take a collection up from their taxpayers. 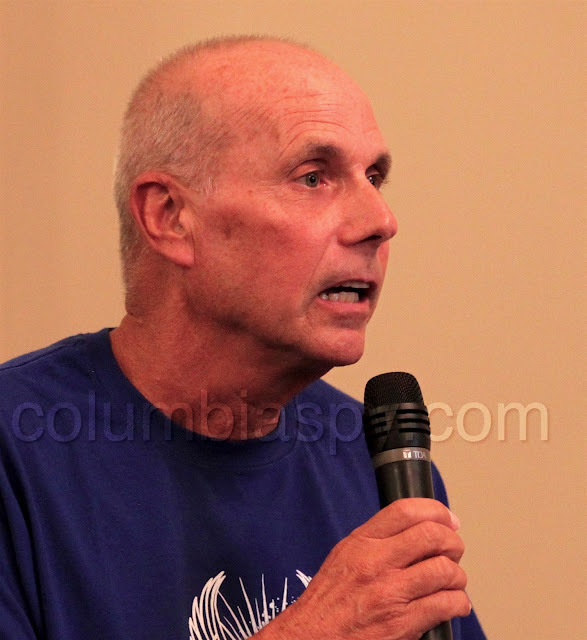 They have many more people that can give than Rob the people of Columbia.End this bogus position now, give us our $165,000 back and Strickler can look for job. This whole deal stinks. If the PDE gets involved and determine that this venture in wrong and would cut some funding, who will make up the loss revenue. Again, this is a thought only. I think that would be divided among the board members. Strickler and Hollister can pay it out of their unemployment checks. Kudos to Kathy Hohenadel for voting against this deal. At least she had the foresight to see this is bad. Vickie Kronenwetter made very good point in the short time she spoke. She is well spoken, educated and admired in this community. Thank you Vickie! I agree, it was great that she stepped up. Thank you Ms. Kronenwetter. Mrs Kronenwetter is an awesome person and resident!!! So when is the next school board meeting? So what exactly can we do to get this overturned? Does the whole town need to show up for the meeting? If so then the word has to be pulled out so we can all show up so they understand we mean business. Please attend the committee of the whole meeting on 9/8 and the board meeting on 9/15. This situation is very serious and the more people of all ages that can attend , the more attention it draws to this truly insane situation. Let's get the number of people into the hundreds. If 6 board members can choose to send my tax dollars to Elanco, can I choose to send my tax dollars to Penn Manor? With all the state aid that comes to us, how can it be legal for Elanco to make a profit from us ? Won't the Governor be happy to see how well we use the State money that he has fought so hard to give to us? We give it away! Perhaps all those that sincerely want to make a bold statement for change should not pay their school taxes until this is resolved. AGREE!!! !Hold you taxes, pay them late , eat the couple of dollars of discount. Let's show these members board that this agreement is wrong. It's probably illegal, at best not in the best interests of the town. It is only, only in the best interests of the one person who orchestrated this whole debacle, over a period of 4 years. Our dedicated teachers and principals have become part of a district where 6 school board members have, through possible unethical actions, diminished our standing among Lancaster County educators. This agreement must end Now before further damage is done. It is shame that our students probably will not meet the so called superintendent since he will only be in Columbia a few days a month. The teachers feel the same way.Going to Strickler will be a lost cause.Get real. If you stutter when you abbreviate director of operations....it becomes doo doo . How fitting!!!! The elephant in the living room is the director of operations. Agree!!!! When are we going to get some facts on this? Maybe he needs to be investigated or at the very least how he got the job. REMOVE this entire school board. NOW. Just what the he-- are t hey thinking? Oh yeah, they're NOT. What a disgrace. Several years ago The investigative reporters from the Lancaster Newspapers spent a great deal of time explaining why our district was not effective. Where are they now when an investigation is needed, when publicity of this current travesty needs to be broadcast loud and clear for everyone to see? Our district does not exist to provide a job for one certain person. In Marietta someone said that the reason people seek to be on council, boards, and committees is status. I always ask myself why people want to volunteer their time and energy, rarely is it for the right reasons, frequently it is for some personal objective. Clearly some on the board were smirking the other evening and talking about the taxpayers in attendance, so it's obvious that they would resort to name calling. I want to thank each person that came to the meeting Thursday evening, but especially those that spoke. Democracy depends on you. This is the way it's supposed to work. We, the people, question those in power. If anyone suggests otherwise, they do not favor a democracy. Again I say thanks, it's wonderful to watch people be engaged in their community. Read in this morning's LNP that the district is starting a reading program that involves all students and employees.Maybe our Doo will read to see what his job description is. After reading the many comments I guess I don't feel so stupid after all! Seems like many were fooled. Back when the idea was floated about sharing a superintendent, I thought it was a great idea. I was the understanding there are certain things that only a superintendent can do and that was what we were getting. I naively thought we would actually be sharing the superintendent, splitting hours between the school districts. I never envisioned this so called director of operations, and if I had, I would have thought we, the citizens of Columbia, through our school board, would choose, hire, and direct this person, not ELANCO. I thought we would actually be saving a considerable amount of money. From what I am reading, if we are saving any money, it is very little, and we may actually be spending more money. How foolish I was! What was the purpose of this venture I wonder. No one can be blamed for being suspicious. The entire process smells of impropriety and back room deals. In closing, I think to myself, how are we better off under this agreement? I personally can't think of one thing. I guess time will tell. The past leaders of Columbia Borough School District would more that cringe at how their once proud district has been given away...all to provide employment for one person who is neither certified nor qualified. This stupid agreement must end , and when it does , the person in question will and should be job hunting. It is a shame that we have had administrators and teachers lose their positions or be driven out of the district in order to save money (or so we are told) and then all of this money is spent on a doo. How can a uncertified, first year administrator be one of the highest paid in the district? People who put in the time, money and effort to earn the degrees and moved up the ladder in education now have to answer to someone who didn't do any of that. How can the board say it needs to cut the high school down to one administrator to save money but then turn around and give away $ 160,000 +++? Was there something else that lead to the removal of a 30 year veteran at Columbia High School? Why was someone with no background in education hired for that position too? Was that money needed for the doo position? Mr. Rhoads made less than Mr. Strickler will but was much more valuable. I agree with the idea of holding off on paying our school taxes until this school board answers what is going on. Right you are, but thanks for considering it. I believe that if residents had to pay taxes in cash once a month and hand deliver it to the office, they would demand to know what it is being used for. Imagine handing $500.00 a month in cash out of your paycheck to an office secretary for Columbia to use as they choose. That's exactly what we are doing. It's neatly tucked away into mortgage payments and payroll deductions so residents don't think about it as much. All by design so the government can collect it on a regular basis. If anything, this has brought the community together... to learn more about this situation and how best to approach anything like it in the future. So happy to see a good turnout for the meeting. Keep up the good work residents of Columbia!